The building that you are about to visit is dedicated to Mary, the mother of Jesus Christ. It has been used for the same purpose for more than 800 years. For the whole of that time it has been a centre of prayer and spirituality for the people of Barton-on-Humber. We hope that your visit will enable you to share that spiritual awareness of God which satisfies a deep desire in the hearts of most human beings. This page leads to a short virtual tour of the Church which you might like to consider doing. 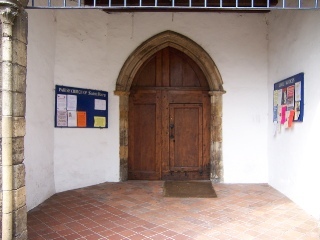 Its purpose is not so much to point out the historical and architectural features of the Church (although some of that will happen) but to enable you to make a sort of journey or pilgrimage round a series of seven fixed points or "stations", and focus your thoughts on various spiritual matters as you go. At each point we have suggested a prayer which you might like to consider using. The tour takes the form of an image map. By clicking on the appropriate numbered site on the plan of the church, you are taken to the corresponding station. When you have read the text you can either scroll further down and visit the next station, or you can close the browser window (or tab) which will take you back to the top of the page. You need not visit all the stations: feel free to pick and choose. Last updated: 23 December, 2007.